زمینه و هدف: اوتیسم یک اختلال رشدی است که با نقصان در مهارت های اجتماعی، تحریک پذیری و رفتارهای کلیشه ای وتکراری همراه است. قصه گویی به روش ایفای نقش یک روش آموزشی جهت انتقال مفاهیم و تغییر رفتار در کودکان است. در این پژوهش محققان به بررسی تاثیر قصه گویی به روش ایفای نقش در بر آگاهی حسی وشناختی وسلامت کودکان اوتیسمی پرداخته اند. روش بررسی: این پژوهش یک مطالعه نیمه تجربی است، که با اجرای قصه گویی به روش ایفای نقش بر واحد های مورد پژوهش انجام شده است. 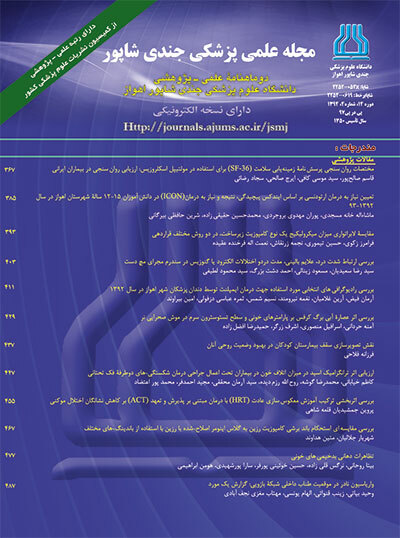 جامعه مورد نظر در این پژوهش شامل کلیه بیماران مبتلا به اوتیسم، که در مراکزاوتیسم شهرستان خرم آباد درسال 1396 پرونده داشتند، می باشد. 30 کودک اوتیسمی 16-6 ساله به روش نمونه گیری دردسترس انتخاب شدند. داده ها از طریق پرسشنامه ارزشیابی درمان اوتیسم (Autism treatment evaluation checklist) که به اختصار پرسشنامه ATEC خوانده می شود، قبل و بعد از اجرای مداخله جمع آوری و سپس پردازش شد. یافته ها: نتایج حاصل از مطالعه با نرم افزار spss نسخه 21 تجزیه وتحلیل شد.که در زمینه مهارت های حسی وشناختی p<0/001)) (t=5/45) بود و در زمینه وضعیت سلامتی (p<0/035) (t=2/21) در هر دومورد تغییرات معنی دار رخ داده بود. نتیجه گیری: قصه گویی به روش ایفای نقش یکی از مداخله‌های درمانی موثر و مقرون به صرفه، برای افزایش آگاهی حسی وشناختی وارتقای سلامت کودکان اوتیسمی می باشد. 1-Kalkbrenner AE, Schmidt RJ, Penlesky AC. Environmental chemical exposures and autism spectrum disorders: a review of the epidemiological evidence. Current problems in pediatric and adolescent health care. 2014;44(10):277-318. 2-Ivy JW, Schreck KA. The efficacy of ABA for individuals with autism across the Lifespan. Current Developmental Disorders Reports. 2016;3(1):57-66. 3-kliegman R, et al. nelson textbook of pediatrics (20th ed.). Autism spectrum disorder. philadelphia; 2016:176-83. 4-DeMayo MM, Song YJ, Hickie IB, Guastella AJ. A review of the safety, efficacy and mechanisms of delivery of nasal oxytocin in children: therapeutic potential for autism and Prader-Willi syndrome, and recommendations for future research. Pediatric Drugs. 2017;19(5):391-410. 7-Stamou M, Streifel KM, Goines PE, Lein PJ. Neuronal connectivity as a convergent target of gene× environment interactions that confer risk for Autism Spectrum Disorders. Neurotoxicology and teratology. 2013;36:3-16. 8-Lotfi Kashani F, Vaziri Sh. Child Psychopathology. Tehran: Arasbaran Publication. 2016.(persion). 9-Shour S, Rostly L. Auism in simple language. Translator Ali Samadi, Tehran: Publishing Duran; 2015. (persion). 10-De Giacomo A, Craig F, Terenzio V, Coppola A, Campa MG, Passeri G. Aggressive behaviors and verbal communication skills in autism spectrum disorders. Global pediatric health. 2016;3:2333794X16644360. 11-Pellicano E, Dinsmore A, Charman T. what should autism research focous upon? Commuionity views and priorities from the united kingdom. Autism. 2014;18(7): 756-70. 12-Leach D, LaRocque M. Increasing social reciprocity in young children with autism. Intervention in School and Clinic. 2011;46(3): 150-6. 13-Brahui D, Delaramizadeh T, Delarami Gh, Kurd Bashir A. The Effect of Combined Teaching Method on Role Playing. International Conference on Economics in the 21st Century; 2015; khash, iran. ( persion). 16-Abareshi R, Teimori S. Impact of storytelling with role play on learning the social skills of impotent mentally retarded children. Journal of Educational research. 2012;31: 37-54. ( persion). 17-Khalaji H. The study of the educational effect of Quranic stories on children's religion. Journal of Educational Propagation. 2012;1: 97-116. (persion). 18-Ajorlo M, Barghi Irani Z, Aliakbar Dehkordi M. The Effect of Stage Therapy on Reducing Anxiety and Improving Sleep Apnea in Children With Cancer and Chemotherapy. Quarterly Journal of Psychology of Health. 2015;5(1): 6-25. 19-Sadeghi S, Pouretemadi H, Fathabadi J, Shalani B. Effect of Social Skills Training on Behavioral Disorders and Social Skills of High-Performance Autism Disorders in Adolescents. Applied Psychology Schedule. 2016;12(4): 216-220. (persion). 21-Asgharzadeh Salmasi F, Poursharifi H. The Effect of Stage Therapy on Improving Social Adjustment in Children with Conduct Disorder. Educational Journal. 2012;4 (14): 13-24. (persion). 24-Shire SY, Goods K, Shih W, Distefano C, Kaiser A, Wright C, Mathy P, Landa R, Kasari C. Parents’ adoption of social communication intervention strategies: Families including children with autism spectrum disorder who are minimally verbal. Journal of autism and developmental disorders. 2015;45(6): 1712-24.